Through the referrers, I just found the video presentation for one of the Knight News Challenge innovation teams, this one dear to my heart: It pushes networked journalism. The audio dies after the first four minutes but those first minutes are a powerful argument for collaboration. Among the tools for networked journalism I’m wishing for is a simple one for creating collaborative data bases. When the Brian Lehrer Show mobilized the people formerly known as its audience to find out the prices of groceries across New York, they entered their findings in blog comments, which were laboriously compiled by hand. How much better it would be if the show had a simple data tool — as simple as blogs and wikis — to set up the basic fields their reporters could have used to report back. It would also be wonderful if that data could then be searched; if calculations could be run against it (give me the mean, the average); if it could visualized in charts; and if it could be exported for mashups (e.g., plotting it on Google Maps). I don’t know whether this is it. But looking at my referrers this morning, I saw that someone N Levels, a startup, had created a form to gather data I asked for earlier: a collaborative data base of wi-fi speeds and prices in hotels. Here’s a description of N Levels that others of you will understand better than I. The goal of N Levels is to enable users to create their own “information networks” that overlay and complement today’s web page and hyperlink structure. By information network, we mean a set of objects that are connected by relationships, forming a directed graph. An object is a collection of properties which represents “something” – it could be a physical entity, animal, person, concept, idea, or absolutely anything. A relationship is a label that defines how two objects are related to each other – for example parent-child, location, containment, etc. An object and its possible relationships is defined by its schema, or “object type”. By having well-defined schema, it becomes easy for humans and software to traverse, consume, and extend an information network. I was talking about such tools for collaborative journalism I wish someone would build with Clay Shirky when he came to talk and share his wisdom with my entrepreneurial journalism class. Clay’s students could do it and we’re talking about that. Here’s another one I want: When a reporter, pro or am, uses a camera phone to take a picture — or, for that matter, to upload text, video, audio, anything — wouldn’t it be wonderful to attach the data the device knows: time and date, of course, and also GPS. This then allows gangs of reporters to submit information that can be plotted on maps and timelines and then associated with other data. See this Dutch experiment in which reporters were given mobile phones that fed through a server that did some of this. And, of course, once news and data is in such a system, it can also be retrieved by location. See Socialight’s brand new service in London: Text 88811 and your GPS phone will give you nearby establishments and also fellow users’ notes. What other tools of networked journalism do you wish for? 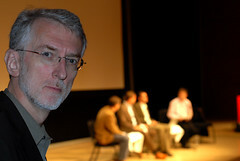 I like this shot from the Networked Journalism Summit. More shots here . Having never organized a conference, I was nervous about so many things before the Networked Journalism Summit we held at CUNY on Wednesday (thanks to the MacArthur Foundation). I think it went off well. Scott Anderson of Tribune put together a good collection of summary bullets. The students blogged the sessions at NewsInnovation.com and we’ll put up video and audio when we can. Robin Hamman called our event “stonking.” I sure hope that’s good. What matters most to me coming out of this is inspiration and ideas turning into action. We will follow up on that action to see what really happens. But I was delighted to hear Jay Rosen say that at the Summit he signed up five partners for his next effort in beat reporting backed by social networks. Henry Abbott said: “I made stars in my notes when I heard an idea that made me think: I should do that on TrueHoop. There are about 40 stars in my notes. Cool!” Here’s the first of those stars in action: collaborative curation of video. Debbie Galant called to say that she has new things to do to try to fix comments. Dan Pacheco is still processing. One local organization was inspired by Jim Colgan’s experiment in crowdsourcing at WNYC’s Brian Lehrer Show and also plans to ask its audience to find and compare the price of a six-pack of beer in their market. That might sound small but I think it’s big because it is about mobilizing the people formerly known as the audience to join in and prove that together, we can learn more than we could on our own. That’s a major cultural shift in news and I am confident it will lead to bigger ideas and more collaboration. That’s what counts. Enough talk, now it’s time for working together to expand journalism. More followup when we poll the participants on what they’re up to next. We will keep sharing lessons and best practices. That, I hope, was is the value of the day. * BUSINESS MODELS: When I asked Backfence’s Mark Potts what he/we most need to get to the next level, he replied, “a business model.” No one has a good business model for this stuff — let alone for the future of news. But as Jay Rosen points out, the crowd was oddly calm given our presence in an overcrowded, leaky canoe headed up the creek with no paddles in hand. I didn’t intend this, but the business discussions at the Summit certainly lead straight into the next event we’re holding out of CUNY’s News Innovation Project — a session exploring new business models for news. This is urgent work. There were sparks of good news about business. Jeff Burkett of WashingtonPost.com said they were getting double-digit CPMs for ads on their new blog networks, close to what they get for the site proper (though he wasn’t exact and we didn’t quiz him on sell-through). Stephen Smyth of Reuters is about to start up a similar network. Rick Waghorn of the UK is learning to sell the old-fashioned way: calling on restaurants and auto dealers. I think it’s clear that there are easy, low-hanging steps the people in the room could take to improve the current business model: Local newspapers should set up ad networks among quality local blogs, allowing the papers to expand their content and reach without cost and risk and encouraging more bloggers to do more good work (‘produce less, gather more’ should be their chant — and the way to encourage others to produce more so you can gather it is to support their work financially). National outlets should organize national ad networks. Mark Potts said it’s likely that the only way to succeed at small is to be part of something big. We must also make it easier for advertisers to buy small and collaborative media. In the networks we create, we must give advertisers what they demand in data on demographics and performance, which small sites don’t have, but which big sites can help provide. But those business models aren’t new enough. We need to investigate and experiment with more ways to tackle the business and ecosystem of news. I’ll post later about the idea of doing a zero-based analysis (how ’80s MBA of me) of journalism. And I’ll start brainstorming here on new business models. * MOTIVE MATTERS: Well, duh, people aren’t going to do this stuff just because we want them to. Jay Rosen said he learned that people need to be motivated to contribute effort to a project like NewAssignment. That motive needn’t be money; it could be self-interest of all sorts: I need to know, I want to know, I wish someone would look into this. . . . But it’s most likely self-interest. So start with money. Earning payment for creating content or coverage is clearly a key motivation and we must have better systems for paying (and more revenue to share). As Merrill Brown of NowPublic pointed out in his session, this also makes contributors more reliable; as NowPublic is assigned news stories by the AP, it has to be able to rely on people to take on the work, and paying them is one way to assure that. Money matters. We also heard from the folks at the Ft. Myers News Press and Gannett that pocketbook issues are likely to draw more interest and effort from citizens who join in collaborative products: How does this affect my life? I raised the idea I’ve learned from my students at CUNY and at Burda that we need to turn the relationship around and enable our communities to assign us to stories we should report, on our own or collectively. They will tell us what matters to them. There are lots of motives. But helping out the newspaper or big-media site is not one of them. And in the end, we mustn’t forget that we, the media, do not own the product of this collaboration. The community does. Jarah Euston said there was some resentment when her Fresno Famous was sold to the Fresno Bee. The community thought they owned this; that’s exactly what you hope will happen when you enable people to collaborate through you: they take on ownership. That’s thinking like a platform: you provide it and people build atop it. At the end, who owns the wisdom and effort of the crowd? Why, of course, the crowd does. * THE POWER OF PRINT: One theme we heard again and again was the power of taking citizen content and printing and distributing that: People, we were told, love to see their pictures or words on paper. It’s a boost to the ego, a validation, and one motive (among others) for producing this content. Perhaps more important is the fact that advertisers, particularly local advertisers, still buy print and so this is how to make this citizen content profitable (as has been done at NorthwestVoice and its California cousins and at Martin Huber’s MyHeimat in Germany). So I think we can make better use of print to promote, to distribute, to encourage collaboration and to sell advertising. But I do think we could be seduced into making too much of print’s connection. We still have to develop the online revenue model. We shouldn’t think that taking disjointed quotes from the public and putting them in print in a ghetto of a feature makes the old products interactive (when this conversation should affect the entire process of news). When I put Debbie Gallant of Baristanet and Jim Willse, editor of the Star-Ledger, on the spot about what they should do together, neither was enthusiastic about reverse publishing, as we call online-to-print. In fact, Debbie turned up her nose at the idea. Jim said that perhaps there should be an online exchange of content (Ledger high school sports coverage for Baristanet local stories) and he talked about an ad network (though he later said — and this is the real challenge — that in local newspapers, ad sales teams are not built for this). I saw them huddling together later. We’ll find out what they were concocting. * COMMUNITY BRINGS COST: Another clear lesson from the best practitioners at the Summit was that there is a cost to community — a coordination cost, as Jay Rosen called it. This is the cost of managing, enabling, wrangling, curating. It is also the cost of cleaning up the bad comments from the bozos. And there is the cost to the brand, the esprit and civility of the community, and its reputation if and when a few misbehave. Many of us measure the value of content and conversation by the volume of comments. But perhaps that is the wrong measure; perhaps we need to measure the quality. Debbie Gallant is looking for some software to help with her comments. Newspapers too frequently have to deal with cesspools of racist comments that collect here and there. Mark Potts and others have tried to get people to use their real identities – which, Mark points out, may be more useful for people when they are your neighbors. But Robin Hamman of the BBC has gone a step farther — one I agree with — and is moving off the idea that community and interaction must happen on your site. Instead, the BBC is trying to organize the discussion happening elsewhere, whether on our own blogs or on Flickr or YouTube. I think that’s smart. Should we close comments? No. But should perhaps we can find ways to — wash my interactive mouth out with soap — to edit, curate, or judge them (and how much cost does that add?). When we create external networks of blogs — in, say, blogrolls — we are selective; why not with commenters (Nick Denton is headed this way at Gawker Media, but then Nick is a believer in the velvet rope). The long and the short of it is that we are dying for a new paradigm for interaction. We all value the interaction. We all have had to deal with the bozos — and, unlike editors in the early days of the internet, we at the Summit did not dismiss all interactivity because of the bad behavior of the few. Indeed, we value interactivity so much so that we are saying quality matters. Short of overcomplicated systems like SlashDot, we just haven’t figured out how to enable and manage this. I see beginning efforts to curate interactivity in services that pick the people who pick the good stuff (champion Diggers or Glam curators — more on them later). * ENABLE AND EDUCATE: As we begin to see ourselves as members of networks rather than owners of content, our relationships with our communities shift. I heard a lot of this at the Summit: We are figuring out how to facilitate our communities to do what they want to do. We are figuring out how to mobilize them to collaborate (what is the price of that six-pack?). We sometimes need to educate people and be educated. And all this means that our people need different skills — and it also may mean that we need different kinds of people. Just as we thought the key to survival in the new age was learning how to make a podcast, the earth moves again and now a key skill is organizing people. Dan Barkin from the News & Observer and Robin Hamman from the BBC talked about that as people in the room wondered of Robin: Are there any more at home like you? Where do you come from? Where do we find you’s? And I wonder how we train them out of journalism school. There’s much, much more but those are the big buckets I saw. Much more to come…. Here’s Bob Garfield’s On the Media report on the Networked Journalism Summit at CUNY. : LATER: There’s quite the discussion between Jay Rosen and Bob Garfield in the comments. Click on.